Where and Who is Conservative? Bush Administration, marked the apogee of the conservative movement. Nate Silver sees an increase in the number of voters with post-graduate degrees who vote for the Democratic ticket. And great graphs from the Monkey Cage about where the white vote went in the last election. 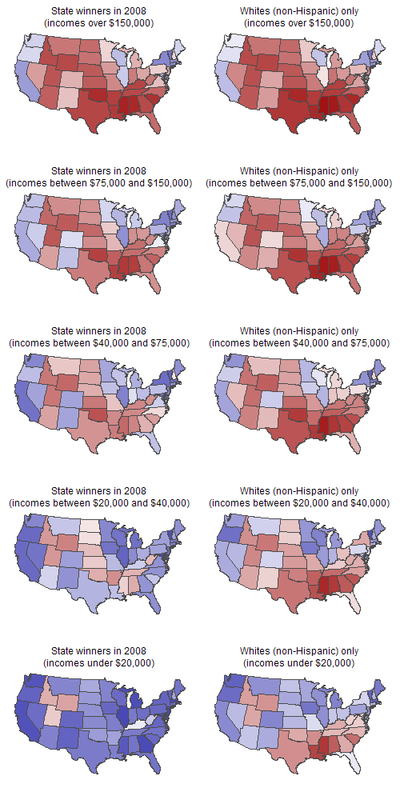 Looks like conservative voters are more likely to be white (non-Hispanic), wealthy, and Southern. I suppose that's not entirely surprising, but it's lovely to see it all mapped out and to see the variance between economic brackets. That’s the Protestants. Lately, I’m shifting to become less Republican and more Catholic without becoming less conversative on anything but economic issues. By ‘less conservative’ on economic issues, I mean less free-market. In the sense of fearing innovation and resisting change, I’ve become more conservative on economic issues (which I imagine is very common right now). Actually, I think Posner wrote both of your quotes. oops. you’re right, ragtime. I’ll fix that. I hope people get more conservative, fiscally. America needs to not create a society of over spenders and over extenders.